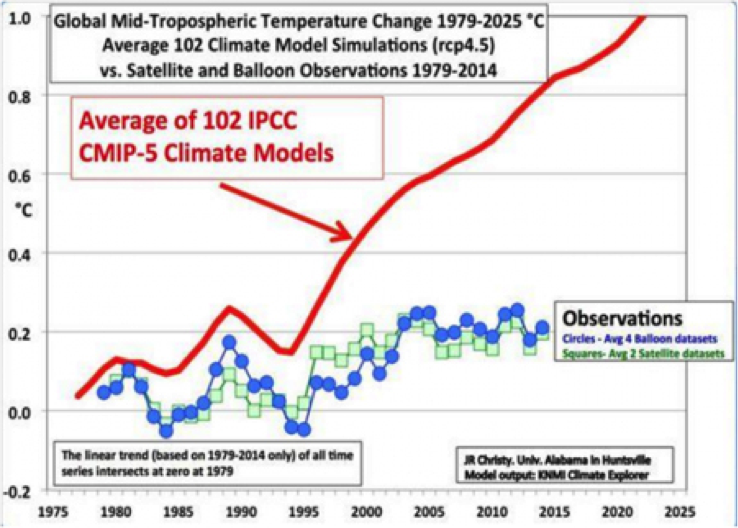 The IPCC doesn’t believe its own models. The 1.5C ambitious target = 400ppm. We’re already there! Apparently we want to set Earth’s climate control knob at 1.5C above the Little Ice Age. If the IPCC is right, we can use cars, hairdryers and air-conditioners to do it. All we need to know is equilibrium climate sensitivity (ECS) and then we can work out the right atmospheric level of CO2 to aim at. Easy, right? Now I don’t believe the IPCC claims, but the IPCC believes the IPCC, and therefore they’ve done this calculation. It’s what the whole Paris convention was for, eh? But something doesn’t add up. If the climate modelers are right, and equilibrium climate sensitivity is 3C, the CO2 concentration we need to aim for is … wait… 400 ppm. How many years have we got to change the whole “human emissions” equilibrium and discover 100% clean energy? Answer: No years. If CO2 is the dominant climate driver, we are already at the “max” set point that 40,000 people in Paris just decided was the holy grail new ambitious target. Turn off the lights, stop the planes, get on your bike. The warming is in the can already. Bear in mind that it is “equilibrium” climate sensitivity, so the warming is not all here yet. We’ve warmed some 0.9C since 1910 (and something before that too) , but the rest of the heat is trolling about in the ocean or somewhere for a few more decades until the system settles down. Strangely, the rejoicing UN crowd in Paris didn’t mention that the 1.5C target means switching it all off, or doing a massive terraforming kind of global engineering project to pack away CO2 — and it really needs to start sooner than is possible, like, you know, 1990. 400 ppm means 1.5C warming doesn’t it? It’s a simple equation. C is the CO2 concentration, and C0 is the pre-industrial concentration (280 ppm). Lately the IPCC has admitted that climate sensitivity could be a bit lower at at 2.5C. But even that doesn’t give us much breathing space to redefine western civilisation. If equilibrium sensitivity is 2.5C, then we are aiming for 430 ppm on the CO2-power-control-knob, which at the current rate will be reached by 2030. In other words, we have to keep global atmospheric CO2 below 430 ppm to limit warming to 1.5C above preindustrial levels. (That is, unless we have to keep it below 400ppm.) Global CO2 levels are rising relentlessly by around 2ppm a year. At this current steady rate of increase, the best case scenario is that we’ve got 15 years to become 100% “carbon neutral”. What does it mean to pursue a target that we’re about to surpass, unless we stop Western Civilization (and East, North and South too)? So either the IPCC is incompetent, or (golly) maybe the point of the 1.5C label is not really about “global temperature” at all. Think of it from a PR point of view. 1/ It implies we can control the climate. 2/ It looks like an advance on the 2C target. 3/Given that the warming has paused, it’s useful to shift those goal posts closer to where the ball keeps being kicked. ( ;- ). Or maybe the UN are really serious about the 1.5C target, and they just haven’t done that first most obvious calculation? 135 comments to The IPCC doesn’t believe its own models. The 1.5C ambitious target = 400ppm. We’re already there! where Pc is the Payola Constant and TP$ is the developed countries taxpayer yearly contribution. where Pc is the Payola Constant and TP$ is the developed countries taxpayer yearly contribution. rearanging for a Pc constant Is that not TPe^$…? or somtin? I do not want to be negative Jo ! I would however be very interested in knowing the formulae for CO2 and how it drives Global temperature. Everyone would, this is the big unknown, or at least its unknown by main stream climate science. Of course, CO2 doesn’t drive the global temperature, it only helps the Sun drive the planet a tiny bit warmer. Put in the context of energy flux, the Earth receives 240 W/m^2 from the Sun and emits 385 W/m^2 from the surface after all non radiant effects and feedback has had its effects on the system and therefore must receive an equal amount. The net input power increasing the surface temperature from clouds, GHG’s, dust, earth/surface interactions, latent heat, thermals and all other factors is 385-240 = 145 W/m^2. Clouds cover 2/3 of the planet and contribute more than 1/2 of this extra warming, leaving about 72 W/m^2 contributed from all GHG’s. CO2 represents about 1/3 of the average GHG effect, so the total contribution of all CO2 towards the surface emissions is about 24 W/m^2. To achieve the stated 3C surface temperature rise, surface emissions must increase by more than 16 W/m^2. Increasing the contribution of CO2 from 24 W/m^2 to 40 W/m^2 is not only ridiculous, it demonstrates the complete lack of sanity checking applied to the claims of the IPCC. In the context of Electrical Engineering, it fails the most basic smoke test. I think the 16 W/sq.m comes from the assumed positive feedbacks like water vapour and clouds, with only coming 3.7 W/sq.m from CO2 – so there’s some huge amplification going on. This whole ‘CO2 causes global warming’ rot is just a bad dream with no substance in reality. But let’s face it, these people aren’t stupid. The people at the very top pushing this nonsense obviously have an ulterior motive and I think it’s about much more than just making money. This is a power-grab. These contol freaks what absolute power (and probably a signficant reduction in the population too). Yes, they assume unreasonable positive feedback. This arises because Bode’s feedback model used as the basis for climate system feedback measures input and feedback to determine how much output to deliver from an external power supply. The climate system has no such external supply and the input and feedback power is consumed to provide the output power. This COE constraint has never been applied and is why they believe that 12.7 W/m^2 of feedback can arise from only 3.7 W/m^2 of forcing. Water vapor and cloud feedback already completely manifests itself in the steady state response of the planet which is 1.6 W/m^2 of surface emissions per W/m^2 of forcing and not the 4.3 W/m^2 required by the consensus. This is yet another obvious failure of the narrative driven science. This is but the claim from the ™CACAC© and their many minions! Measured ex-atmosphere insolation is 1340 W/m², while measured surface emission is no more than 40 W/m²! All the rest of Earth’s EMR exitance to space originates from the atmosphere! This is greater than 200 W/m²as measured. ™ Clueless Arrogant Climate Academic Clowns. kaka! I have no problem with Dr. David Evans using the CACAC numbers to demonstrate how very,very wrong they are. I have nothing but highest regard for the late Dr Noor Van Andel, and his work. Although the work of Dr. Ferenc Miskolczi is hard to read and difficult to interpret with his two stream approach, I find no error. I instead find an approach to analysis of Earth’s atmosphere above the tropopause compelling. As far as Dr. Kevin Trenberth’s work, it only demonstrates that he, like most clowns cannot locate his own gluteal muscles with one or more upper appendages. Not even one of the CACAC members would know how to even approach measuring surface EMR exitance. I have done so, but only indirectly, by measuring the 8-14 micron BRDF “bidirectional reflectance distribution function” for selected surfaces. Even this, so far, has never sucessfully been done for ocean surfaces. Trenberth’s numbers come only from the ratio of floaters to sinkers in his own toilet! Not peer (or pier) revued etc. Not in accordance with IPCC dogma. Actually, the 40 W/m^2 of output originating from the surface represents a significant underestimation by Trenberth and if you ask him where this came from he has no good answer. Also, no emissions actually originate from the atmosphere. Most outgoing emissions of the planet originated from the surface and what is presumed to come from the atmosphere are simply delayed surface emissions. This is another COE constraint that the consensus seems to miss because once a photon of energy emitted by the surface is absorbed by the atmosphere, it can come back out of the atmosphere once and only once (either out to space or back to the surface). this is the big unknown, or at least its unknown by main stream climate science. AS far as I know these are standard assumptions used by the IPCC. The logarithmic responses is exactly as Jo has quoted above. From that Archibald gets an ECS of about 0.35C (for doubling of the CO2 level). David Evans has derived an even lower figure of about 0.1C (by taking into account actual observations). If Archibald and Evans can work that out then so can the scientists at the IPCC. And doubtless they have done that. So it can only mean that they do not want to work it out because it means that the effect of increased CO2 on the mean earth temperature is negligible! I think Archibald is being very generous to say that water vapour accounts for 80% and CO2 10% given that water vapour makes up ~1% of the atmosphere on average by volume (see NASA’s Earth Fact Sheet) or about 95% of the greenhouse relative to CO2 (1%/0.04%). Also molecule for molecule water vapour is more potent and absorbs energy over a far wider energy-wave spectrum. Maybe even Archibald corrected for these things he would get closer to David’s 0.1C? My simulations show that CO2 is about 1/3, H2O is about 2/3, all of the rest combined is less than 10% with ozone being the largest contributer. Also, while the GHG effect + clouds makes the planet 33C warmer, it also makes it 23C colder. Without GHG’s and clouds, the surface would receive 341.5 W/m^2 rather than 239 W/m^2 and the temperature would be 278K not 255K. So, if you include the negative feedback effects from reflected power from clouds and ice, which is also a consequence of the feedback, the planet is only about 10C warmer than it would be otherwise (actually a little more if you include the intrinsic reflection of the planet). That’s the point that most people would like to know, what is the relationship between global temperature and levels of CO2? I haven’t seen one yet of any significance, that is at least at the 5% level, preferably at the 1% level. Otherwise, it is all bravado, politics and hot air, and will not make an iota of difference to global temperatures. That’s the problem though – they are not interested in finding such a relationship. It’s no longer of any relevance to them. They have made up their minds and they are now going to introduce their ETS scams. The only simple way to reverse it is to get the scientists to come out and admit they got it wrong. The more complex way is through the courts using people with big pockets and clever lawyers. If we are going to wait for enough of the public to be educated about the truth to make a difference we will be waiting a long time, by which time it will be too late. I think the best answer to that is that there is a slight cooling effect when more CO2 is added to the atmosphere, but that cooling effect is very small and we might not be able to measure it no matter how good our instruments become. CO2 in the atmosphere certainly never warms the surface, but as the planet warms for other reasons CO2 will increase after a lag time. …what is the relationship between global temperature and levels of CO2? The question itself has become like a bad joke. The answers are all over the map. So seriously, why should anyone even care what the answer is? No matter what we do we cannot control the weather to meet our specifications. All we can do is waste our resources in a futile attempt to do the impossible, all the while, enriching the unscrupulous who take advantage of our fear. All true. Won’t stop the governments introducing additional taxes to rip off more money form us. They can call it ETS for now or something else later but it’s all the same. Nothing to do with CO2 or global warming. If anyone really believes we could even have a tiny impact on climate change by introducing such plans, well I won’t say what I feel like saying as I know I would be moderated. You get the picture. For Australia, I think TonyfromOz has the answer. The Minister for Golden Sacks should declare martial law and have ALL of the coal burning power stations shut down and gas turbines simultaneously. It would only be a week or ten days, and you wouldn’t find a green weeny on the entire continent. Well, actually, all of the weenies in the fridges and freezers would be green, but what’s a green weeny when it is time to save the planet? The difference between Transient Climate Response and Equilibrium Climate Response according to the IPCC is here. Basically the IPCC doesn’t have a clue as David Stockwell’s graph published by Jo shows. Arguably there is no difference between TCR and ECR as this post and previous work shows: see conclusion. I repeat from my comment in reply to Will above -CO2 and H2O vapor changes individually have no effect on that. Cohenite thanks for that. If you look at the trend of sensitivity estimates in the graph in Jo’s piece that you linked to it is an almost straight line trend down. This prompted me to include the following in my letter to my grandchildren just to show them that someone is thinking about them. By the way, isn’t it wonderful how far the ‘science’ that was ‘settled’ in 2000 has advanced since then? I did read all the referenced links which helped me understand the problems with the IPCC model projections. The IPCC base their claims on model outputs. Not data. They seem to only lower the climate sensitivity over the years to maintain soom what of creditability with the AGM cult. They are trying to prevent cult members from climing the fence and returning to reality. Thank you for posting the referenced links! There’s little difference between TCR and ECR simply because the planet responds to change far faster than the IPCC requires for their definition to be relevant. ECR is well defined as an average of 1.6 W/m^2 of surface emissions per W/m^2 of forcing. Incremental ECR must be less than the average ECR due to the requirements of Stefan-Boltzmann which dictates that each additional degree of warmth takes exponentially more power to sustain than the previous one, hence the incremental sensitivity must be less than the average sensitivity, which at 1.6 W/m^2 of surface emissions per W/m^2 of forcing translates into an absolute upper bound on the sensitivity of about 0.3C per W/m^2. It went wrong from Day 1: the claim that Earth’s surface radiant exitance is a real energy flux increases claimed SW thermalisation energy in the climate models by >53%, as a simple energy balance reveals. They then spent nearly 40 years inventing more and more sophisticated ways of hiding this mistake to satisfy their political and corporate paymasters using fake CO2-AGW to scare the punters. Yep!! But how large of a con? This seeme to include all of academia and the peer review grail! Please remember the way Earth’s atmasphere transmits IR EMR or not, was known Months before day 1, by all, including your Dr. J Hansen NASA Goddard, who knew of the previous work done at the USAF Cambridge Laboratories near Boston. Now what do you think of your boss? Climate “scientists ” only real roll is to make sure they say what the politicians tell them . anything they produce is politically driven garbage . Why else have they consistently grossly over stated actual warming ? the fraction of 1 % human caused Co2 so that temperatures stay at an arbitrary number. Yet the majority remain silent . Bought off , intimidated ,and dishonest …the modern day climate white coats . In any event they have completed their assignment and will drift back into obscurity until the government tells them what to produce . Actually, according to official IPCC numbers it is even worse than you make it out to be, since there are other non-CO2 forcings (CH4, N2O, O3, CFC’s, etc.). If you take the “moderate” rcp45 scenario, for example, the IPCCC shows the total forcing from “pre-industrial” 1765 to 2015 to be 2.343 W/m^2. This includes cooling anthropogenic aerosol forcing, currently assessed by the IPCC to be -0.739 W/m^2; however, the aerosols come from burning fossil fuels. If we stopped burning fossil fuels this afternoon the anthropogenic aerosol forcing would quickly (in a few weeks) approach zero and the total forcing would become 2.343 + 0.739 = 3.08 W/m^2. Assuming a nominal IPCC equilibrium climate sensitivity of 3.0 degrees C for a doubling of CO2 and a nominal IPCC forcing for doubled CO2 of 3.71 W/m^2 the equilibrium temperature change would then be (3.0)*(3.08)/3.71 = 2.49 degrees C. We’re already doomed! And you get this odea of some “forcing” from where? At last a formula between CO2 and T.
So it is to be found in the IPCC reports? I mean, considering how much stances similar to “the science is settled” are displayed and how much warmists and catastrophists recall we are no more in science debates but in risk management meetings, it would be very disturbing for this formula to never appear in any climate discussion at all. Public ones included. Except if that formula never appears in the IPCC reports to begin with. Which I assumed up until now. Indeed I though this stuff was more complicated than that due to the fact it is never really discussed or even showed. But complicated or not, it is no excuse to never have a data table (or a graph) like the one you gave. I mean, 97% of scientists with a 95% degree of confidence and just recently an incredibly big meeting of lots of nations in Paris? Surely there must be some data like that and participants of the COP21 must have based themselves on such data, even if they differ in values. Alas I have only been able to find either pure CO2 data or pure T data, very apart from one another and pretty much unrelated to the political claims resulting from the COP21. The data are only invoked to draw a picture saying it’s increasing. And anyway they are drowned into a sea of urgency and bleak claims or political-like descriptions of what’s at stake. I’m starting to believe that people don’t care about the issue not because they know they are being served a narrative about the data that appears to be fictional even under superficial scrutiny, but because they know they are being served a narrative about all these political meetings whose outputs are totally out of anyone’s reach. While I’m sure activists think it is thus a good strategy to call the public to act and commit to the issue (otherwise things will stall), I’m also pretty sure the thought of behaving all activist-like makes a lot of people uncomfortable since activists can only serve them grand visions of changing the world and partial data about something supposedly global. I agree with you and its seems the IPCC is telling President Obama the science is settled while they have been lowering the equilibrium climate sensitivity of 4.5 deg C in the year 2000, to a lower level of 3.0 deg C, and now recently the IPCC admits the equilibrium climate sensitivity may be as low as 2.5 deg for 2015. CO2 continues to rise approximately 2 ppm annually over this same time period. Perhaps the IPCC would like to tell President Obama that the science is no longer settled, only the politics are settled. What a relief to see that at least someone in our parliament is writing the truth like this. Matthew says “In just the past 18 years we have experienced one-third of the increase in atmosphere co2 since the industrial revolution but temperatures have not increased as expected. Here here! How refreshing to hear a politician speak like this. The nationals appear to have a handle on realism at the moment. Craig Kelly is also vocally skeptic. His Facebook page makes me wonder how and why he is still in the party. He taunted Turnbull without mercy during Paris. I was quite impressed. I just wish he would cut the umbilical and join the ALA or LDP. I read that article with great interest. I wondered, what if, say, $50 mil of govt grants were made available to study the non-warmist side of CGW? I would be willing to bet that a large number of so called warming scientists would be first in the scramble put their snouts in that trough. Hypocrites!! Note that they are only going to hold the increase to 2°C. They are merely going to pursue efforts to limit it to 1.5°C. This is different from limiting it. This is also different from effort to limit it. It is stated only that they are going to pursue efforts to limit it. Possibly, in the light of reality, they will, instead, try to pursue efforts to limit it, and it would not be inconsistent with their charter to investigate trying to pursue efforts to limit it. The language of the agreement is patently that of mendaciousness. It oozes equivocation and reeks of dishonesty. Nice to see the theory labeled for what it really is, what the gen pop really want it to be and what the people with noses deepest in the trough probably hope it isn’t. An easily adjustable thermostat for global climate. I think for most of us that notion is basically madness, but many believe that is exactly how it works. You can dial the temperature and predictability of the climate up and down by simply raising and lowering CO2. Its amazing to me that anyone believes it, but then most of the planet has a personal god so I guess I shouldn’t be surprised. The thing about Paris though is the world’s chief climate scientist (Obama) declared the problem was solved and the planet is saved. They defined the problem, set a KPI, stated they had achieved it and all clapped like Seth Blatta applauding himself on behalf of FIFA. So given the goals have been achieved, why are we even still discussing this? I thought Paris was basically the skeptics best case scenario outcome. I did not expect to hear them say…”we have saved the planet”. I thought that was too dumb even for them, because how do you ramp up the fear now you have stated the problem is solved? Of course its all complete crap… but so what, its historical crap now, surely we can find something else to wet the bed over, it was getting boring anyway. The guy that cautions against predictions appears to be AWOL, and I agree that it is risky making predictions, but nonetheless if this comes to pass, it might well change some attitudes towards the most vicious farce to be ever foisted on mankind. The whole global warming/climate change/compensation mess could be solved with a volcano tax, and/or an ocean off gassing levy. Haven’t you forgotten the other GHGs? What about CH4, NOx and Halocarbons? As the CO2 increase from 280-400ppm is only about 50-60% of the increase in GHG contribution to warming, should the warming be nearer to 2.5-3.0C be now? What we need is for the entire UN/IPCC crowd and their followers who gathered in Paris, and all warmistas around the world, to start saving the world now. They need to set the example by stopping flying around the world on CAGW junkets, stop driving carbon burning vehicles, go off grid and survive in their sustainable abodes with limited heating and certainly no airconditioning. I hope Al Gore is the first to set the example by selling off his beachside mansion and other properties and retreating to the hills to meditate. On Al Gore’s home planet of Itsacon the climate doesn’t change. When one states we have already had 0.9C of warming since pre industrial times and we have not yet reached equilibrium, the IPCC claims almost start to seem plausible. That is until one starts to look even a tiny bit deeper. For example, most of the warming occurred before 1950 and the start of the rapid rise in CO2. Pre-emptive warming? The effect occurring before the cause- now there is a post modern scientific idea. Then again, the rate of CO2 rise is increasing but the temperature rise is slowing, or should that be “has stopped” – yes the dreaded pause. Further if one looks at the satellite record it shows anything but a nice steady rise matching the rise in CO2. In fact it shows a steady temperature from 1978 to the 1990′s, a rapid – almost step change in temperature of about 0.3C followed by a another plateau for the last 18 years, nothing like the steady increase in CO2. So lack of correlation proves causation – another post modern scientific concept, we are making scientific progress! Ahh but I am being silly, everyone knows one has to use a linear fit to our data no matter whether it fits or not, and once one does that look! our linear temperature fit matches our linear CO2 data fit. So, once we force a linear fit to both data sets, why they both show a linear trend, perfect match! I really need to get with the post modern trend and abandon all my outmoded attitudes. (If you need a sarc tag to the above you must be asleep). More seriously however, a theory can never be completely proven but it can easily be disproven. In this case the core portion of the AGW theory is that man is driving up atmospheric CO2 and rising CO2 increasingly reduces long wave emission to space. Constant energy input and falling energy loss means Earth is retaining energy which must cause it to warm. So the absolute prime requirement of this theory is that Earths energy loss to space must be falling as CO2 rises. Pity that according to NOAA (certainly not a skeptical organisation) earth’s energy loss to space has been rising at least since the start of satellite measurements in 1978. That fact entirely by itself is enough to disprove the AGW theory. Of course AGW proponents recognise that and have come up with an answer. Actually CO2 only is the trigger, causing some rise in temperature which causes more water to evaporate and the water, being a strong green house gas, absorbs additional incoming solar energy which would otherwise be reflected back out to space (ie: it reduces Earth’s albedo) and it is really the increase in absorbed solar energy which drives warming. Then as the temperature rises further, black body emission increases which more than counteracts the impact of CO2 induced drop in emission in the first place so emission to space actually increases. Interesting twist but that further refinement is also amenable to test. You see, if the extra water vapour in the air (always assuming there is extra water vapour in the air) is absorbing more solar energy that energy must go to heating up the water vapour (and by contact the air) absorbing it. This leads to the prediction that the middle to upper troposphere in the tropics (where he incoming solar energy is strongest) should be warming significantly faster than the surface ie: the tropical troposphere hotspot, a core prediction of the CAGW theory. Unfortunately, thousands of balloon flights and satellite measurements have universally failed to find any trace of such a hotspot. So that addendum to the theory is also busted. Oh if you need any more confirmation, another inherent prediction of the above theory is that the increase in long wave emission to space should be less than the temperature rise would suggest since the increase would equal the rise due to temperature increase less the fall due to higher CO2. Pity that, according to the NOAA data, the increase in emission to space has been greater than would be predicted from the rise in temperature according to the Stefan Boltzmann law. It does appear that CO2 is influenced by rising temperatures and not the other way around. Imagine we are living in the High Middle Ages and natural out gassing is producing 218 gigatoms of CO2 annually, there is nothing we could do to prevent the havoc of a Little Ice Age which will soon be upon us. Its worth considering that in our present Modern Climate Optimum, even if humanity increased their pitiful output from eight gigatons annually, we still can’t stop the cooling just around the corner. Even Bernie Fraser (ex chairman of the Climate Commission) should be able to understand that. Pity that, according to the NOAA data, the increase in emission to space has been greater than would be predicted from the rise in temperature according to the Stefan Boltzmann law. My mistake. I meant Climate Change Authority. I downloaded the original data from NOAA and analysed it – a very time consuming task. The result i got exactly matched the published graph at climate4you.com so I would claim that the analysis of the NOAA data done by this site is accurate. This plot shows an increase in outgoing longwave radiation of 2 watts/sqM over the satellite record. The temperature rise over the same period as shown by satellite data is 0.3C. That translates to 2/0.3 = 6.7 watts/sqM/C. At 288C the first derivative of the SB equation yields 5.4 watts/sqM/C which is less than 6.7. However, even worse, at 288K (14C) the emission of a black body is 390 watts/sqM whereas the Earth only loses 240 watts/sqM. So, at least to a first approximation Earth should be considered more like a grey body with an emissivity of about 240/390 = 0.62. In that case the SB equation would predict a sensitivity to temperature of about 5.4 * 0.62 = 3.3 watts/sqM/C. but 97% of scientist can’t be denied. The IPCC (UN) is both incompetent, and also, at the same time, it is not serious about the 1.5C target. The two are not incompatible, as they are aiming towards the Socialist Utopian Dream of a pre-industrial neolithic Society in the World, guarded over by a Sharia Caliphate. The chief concern is now to stop people examining the Sun as a possible main source of heat. BTW I see that for India etc it will be business as usual after the Paris lunacy. India still intends to double coal output by 2020 and full steam ahead for decades to come. Ditto China etc, what a farce. Yet the OECD countries intend to waste trillions $ for zero change to the climate or temp by 2100. Of course both of our major parties will be exporting as many millions of extra tonnes of our coal to China, India, Korea, Japan, Europe etc after the 2016 election. Does any of this make any sense. What a fraud and con. 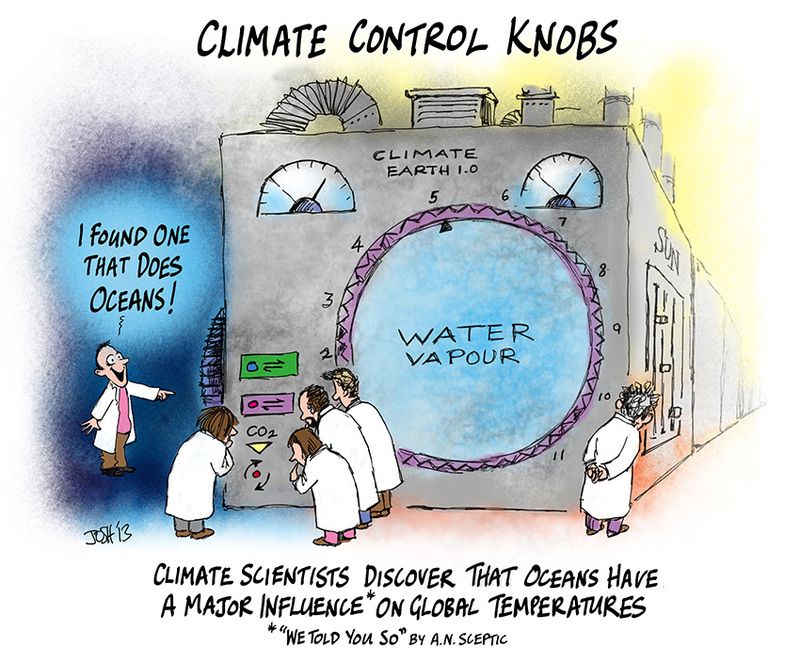 It’s obvious after Paris the climate control knobs have turned it up to 11! Excellent thread. Basic back of the envelop calculations indicate even if 100% of the warming in the last 150 years is due to the increase in atmospheric CO2 there is no CAGW issue to solve. Basic back of the envelop comparison of the IPCC’s general circulation models vs observations indicates the models are all incorrect (Weird! How is possible that all of the IPCC’s GCM models are incorrect?) and again that there is no CAGW issue to solve. The paleo climatic record indicates high latitude regions (same as the regions that recently warmed) of the cyclically warms and cools. Solar cycle changes correlate with the cyclic warming and cooling. It appears a significant portion of the warming in the last 150 years is due to solar cycle changes (more than 75%) rather than the increase in atmospheric CO2. origin outside the Earth system; oscillatory modes within the Earth system can be expected to be far more irregular in period. Josh illustrates the folly of that notion beautifully. It’s the pretence of science which is so infuriating. Now an equation! Well that must be science then. Even a logarithm to the base 2, which is weird in science, not that it matters mathematically but it makes you think is a made up equation, created to fit the conference? As the conclusion of the conference is just a big money transfer, there is no intention of solving any problem. Also there is the tacit admission by the ‘developed’ countries that they are entirely and solely responsible for the CO2 increase, ignoring the increase in world population of 6 billion people over the same time, most not in developed countries. So with guilt admitted freely, just watch the Chinese and Indian governments make massive claims for reparations for ‘historic’ levels while they push new levels of CO2, untaxed. This is nothing to do with climate or real science. Would merchant bankers sell carbon indulgences if they did not work? No answer required. It is almost unbelievable that an ultra rich merchant banker has appointed himself Prime Minister of Australia on a platform of an ETS (External Taxation System) and no one says anything? Not even the Labor party or the Greens. All he has done so far is undo everything the elected government has done in two years, with the exception so far of the boat turn backs and the Carbon tax. We know what is coming, but nothing is said except by a few brave Liberal politicans, many of whom are resigning. Our new PM even has the head of the secret police directly phoning politicians to tell them to say only what they are told to say. Forget freedom of speech. Labor and the extreme Greens say nothing. Why would they say anything? The work is being done for them. The Paris ‘agreement’ is so self evidently nonsense there’s not much worth saying. Delightful, Chris Monckton’s tinkling the ivories. … which was: “Honestly, I’ve been a bit surprised that the climate talks historically haven’t had R&D on the agenda in any way, shape or form”. From the mouth of one of the world’s richest (and smartest) men has come a terrible truth. That climate change activists are not really interested in the future. They simply want to turn back the clock. Gates made his fortune as the founder of Microsoft, one of the world’s biggest software companies, and he did that by understanding the benefits of technology research and development because what you see today will not be what you get tomorrow. Essentially, that means “times change” and with the change come better ways of doing things. Imagine a world without computers, or the software to drive them. That’s the point Gates is making. He started his technology and business life at a certain point in time, back when pens, pencils, slide-rules and pocket calculators were cutting edge research tools. Once you understand how investment in R&D drives change you’re ready to ask the same of the Paris climate activists who seemed happiest when dancing around the Eiffel Tower wearing silly masks and face paint. “Stop the world I want to get off” was the common (if unspoken refrain) from the latter-day Luddites who long for a world without carbon, which is bit like wishing for a world without people. (Note to self: that might not be a bad idea). In any event, Gates nailed an issue which everyone else missed and that is the problem of simply suggesting laws limiting carbon dioxide emissions without analysing the other half of the equation which is funding research into ways to achieve that goal. GRAPH: That nearly invisible yellow sliver at the top (“other renewables”) is the current contribution of wind and solar to global energy (in millions of tons oil-equivalent). Clearly that 1.5 degree target is toast, but what about 2 degrees? How much carbon-free energy must be deployed to reach the promised land? It will take massively ambitious measures to halt these trends and shift toward cleaner energy. To prevent serious global warming, as the University of Colorado’s Roger Pielke Jr. likes to point out, carbon-free sources will have to rise from 14 percent of the energy supply today to more than 90 percent by the second half of the century. That means (roughly) deploying 1 gigawatt of carbon-free power every single day for the next century — the equivalent of opening a large nuclear power plant around the world every day, or raising 1,500 wind turbines every day. It will mean shifting our cars and trucks to clean electricity, overcoming the intermittency problems with renewables, radically increasing energy efficiency, finding new ways to fuel our ships and airplanes (hydrogen? biofuels?) and steel and cement production. They’re in the pay of Big Potty. O/T but just in time for Christmas! Go to the top of the tree. Earth’s moon from drifting and stay? Ruairi , I am sure they can fix that too , with say …..A Great Big New World Disorder ‘Moon Tax’ ! Whoops , better not give them ideas ! By the way, if you want to know, the meme about the 2 °C target – so popular among some politicians in recent 10 years – wasn’t invented by a natural scientist. It arose as a rehashed random sentence from a paper by economist William Nordhaus from the 1970s. He said that 2 °C might be bad, 3 °C would… and 5 °C would… and the activists picked the first one because it brings the fear – and their influence – closer. The meme began to spread and people forgot about the origin of this “lore”. No scientific paper has ever derived any number of this kind. This meme was pretty much imposed on some would-be scientists by the politicians. I have been following the “Australian Skeptics Inc.” on Facebook for a while now. Why am I increasingly getting the impression they treat the word skeptic in the same way John Cook does? The latest post is about Dr Karl warning against the dangers of getting your science from the MSM. Now is that the greatest irony in modern history or what? Why am I increasingly getting the impression they treat the word skeptic in the same way John Cook does? Ok, why are you getting that impression? I went to the site and I did not get that impression. Please explain? Like I said having followed their facebook for a while they tend to post a bunch of pro AGW stuff. I guess if you take the view that classical skepticism should align itself with the “prevailing” science, then its fine. I don’t. But frankly I find the notion of Dr Karl lecturing on the quality of science presentations offensive. Interestingly, the poll also found that 77.2 per cent of voters want Australia to move to 100 per cent renewable energy. James Hansen is probably the best informed or perhaps the only real expert on this matter. OK, that’s an exaggeration. There’s a PDF of a report of the Royal Society which ends with the assertion that to stop all fossil carbon burning NOW would still leave us with centuries before the atmospheric CO2 goes down to pre-industrial levels. Explain CO2? It’s like this: If you leave three identical plates out on the snow, on a sunny day, different only in that one is black, another white and the third polished silvery, they will melt the snow under them at different rates. We cannot see the spectrum of infrared light, although pit vipers do see a range of it, but the differences in infrared “colour” of the atmosphere vary with the presence, even minute, of certain gases. At the other end, we know that ozone catches ultraviolet photons, or we’d all have skin cancer. Hourly radiation from the sun carries a quantity of energy that is prodigious compared with industrial and domestic convenience energy emissions. But the problem is that the planet has to get rid, in an hour, of as much energy as it received. It does so with huge numbers of the rather weak photons emitted by merely warm, or even cold objects. These are infrared. More “greenhouse gases” .. carbon dioxide, some nitrogen oxides, and carbon tetrahydride tend to block the least energetic of these photons, and therefore the source has to get warmer to get the energy back out. Carbon tetrahydride is of course the analytical name for methane, popularly known as “clean natural gas”. It is tens of times stronger a GHG than carbon dioxide. CO2 levels have always gone up and down. Why? What is the mechanism? How can anyone be sure whether the increase is man made or not? The answers are very simple. Measure the C14, which occurs only in modern air and not in oil, gas or coal. You can directly measure the amount of ancient CO2. It’s under 5%. End of story. The claim that CH4 is 10 times more powerful than CO2 as a greenhouse gas is based on it’s supposed persistence in the atmosphere and not its spectral absorption capacity. Check out the absorption characteristics here. CH4 has a tiny absorption spectrum compared to CO2 and that is entirely within the H2O absorption regions. Yes, the really deadly greenhouse gas from combustion of fossil fuels is the dreaded oxygen dihydride, whether from smokestacks or car exausts. It is highly visible and even forms other solids such as water, ice and snow. It can be up to 4km thick in glaciers and reflects over very wide parts of the spectrum and the world is 2/3 covered with it. Ban H2O. CH4 is quite benign by comparison and combusts anyway. H2O is around forever, great oceans of the stuff, affecting the weather every day. The part the gets the most of the solar radiation is the great global ocean. Its coefficient of temperature to energy per unit surface is far lower than the atmosphere’s. Its thermal sensitivity to radiation is therefore very low. In other words, a one degree increase in its average temperature is a hell of a lot of heat. Add to that the melting of Arctic ice, which unlike the ice of the Antarctic landmass is directly exposed to the ocean’s heat, and we should regard the variations of atmospheric temperature as too difficult to account for, to prove anything. ‘Conventional climatology has it that an active sun creates more ozone in the stratosphere which is why the expanding ozone ‘hole’ and the cooling stratosphere (less ozone) were deemed a man made problem during the recent period of more active sun. ‘The feature that I proposed and which was supported by certain observations was that an active sun increases ozone below about 45km and above the equator but at the same time reduces ozone above about 45km and above the poles. ‘As far as I know nobody else has inserted that factor into any other model or hypothesis. ‘I deemed that scenario essential if one were to produce the latitudinal climate zone shifting and associated changes in jet stream behaviour that were actually observed from MWP to LIA to date. ‘In order to get such latitudinal shifting over time it is necessary to alter the gradient of tropopause height between equator and poles and stratospheric ozone variations are the only means I know of to achieve that. So the oceans get hotter. Then? They have dissolved 50x as much CO2 as the air itself. Heat it and what happens? Atmospheric CO2 goes up. Even an average 1C in surface temperature is enough for a 50% increase in CO2, even though you would not notice it. So does the warming produce CO2 or does the CO2 produce warming? I think you have just argued the first, not the second because the air temperature has not changed in twenty years. The presumption in man made global warming is that our fossil fuel output is so horrendous, we are filling the air above unilaterally with CO2 and that the earth and the oceans cannot cope. That’s human arrogance. It just isn’t true. Humans and human output are almost insignificant and no, you cannot see the Great Wall of China from space. The CO2 just disappears into the oceans. Rapidly. Do you really think James Hansen is going to admit that? The problem with the Paris talks, the EU, the IPCC, and even the USA, is the belief that the energy resources (I did not say technologies) that lost entirely to fossil fuel use, can make a comeback. That IMHO means that they underestimate the problem. The USA twice threw away energy technologies that can still do to fossil carbon what fossil carbon did to wind, rain, sunshine and biomass. The case of wind ought to be staggeringly obvious. Imagine trying to drive the Cutty Sark, Nelson’s “Victory”, or even Francis Chichester’s “Gipsy Moth” or Drake’s “Golden Hind” with any imaginable derivative of wind turbine-ness. The capital ships of the most powerful navies of the world have discarded petroleum as their source of propulsion. They use nuclear. If the West (including Australasia!) ignores the above reasoning, China will rule the energy world. The PRC knows how filthy coal and gas are, and have launched a thorium reactor program, based upon the Molten Salt Reactor Experiment that Nixon abandoned. Coal is relatively cheap and safe, while nuclear has inherent dangers. Politically its dead in the water and when global cooling kicks in I expect all counties (as a duty) to produce more CO2 with new state of the art power stations. China is cornering the market. The time will come when our old coal fired plants will need replacing, and China is now the goto Country for the best technology. They got the majors to install the first and then they just, umm, copied the rest, and along the way improved on them would be my guess, because now they are doing it all themselves. The irony is that we might actually have to seek out that technology from China. I still smile when I remember what happened at Tumut Three. In the early days, all the work at Snowy was done by the Americans and Europeans. When they wanted to install all new equipment for Tumut 3, they sought out the Japanese, then the state of the art manufacturers for that sort of equipment, and you should have heard the grumblings even then, more than 20 years after the War. Toshiba did the turbines and Melco (also Japanese) did the 6 X 250MW generators. Tumut 3 is a 1500MW pumped storage plant, and it first came on line in 1973, so even that is now 42 years old, way way older than any renewable will EVER be. The units are 1800 metres below the reservoir at Talbingo. Well best of Luck! Apparently we are about to go to WAR with them (no joke). Right Tony, for the 3 Gorges Dam Hydro the Chinese bought the first six turbines and generators of 600 to 660 MW from US, Germany, Japan & Switzerland, then made the next 26 turbines/ generators of 700 MW themselves for a total installed capacity of 22,000 MW far exceeding any other Hydro scheme. Read recently that last year china bought over 75% of the world largest robotic plants. There’s something really intriguing going on with China’s Hydro plans. I even contacted a Hydro Engineer, who sort of hinted that what I might be alluding to was not really all that feasible, so I canned the project to write about it, because I was not certain. I have kept trying to find information about it, but again, there is an air of real caginess about anything happening here. My speculation was that they might construct a series of hydro plants of a series of units from the upper side of the great canyon through the mountains to the low side, a quite long distance and an incredible engineering feat. The hydro units themselves would be inside the Mountain for the first half of the distance, and then the remainder would be on the surface, along a natural gorge leading back to the same Yarlung Tsangpo on the low side of the great canyon gorge. Hydro plants inside the mountains on either side of a huge dam has already been achieved and operational at a couple of places in China already, the largest of them at Xiluodu, where there are 9 X 770MW units in one turbine room inside the mountain on one side of the dam and the same on the other side for a Nameplate of 13,860MW in total Nameplate. Over the last Month or so I’ve heard rumours (and be aware they are still only rumours) of plans for a nine cascading series of plants in that area, sort of along the lines of what I was speculating about. If it eventuates, that will be some humungous engineering feat, the same water flowing through a series of plants with nine cascades. Still rumour I know, but something like this would make Three Gorges pale into insignificance. Keep in mind China Hydro already supplies 22% of China’s total power, the greatest amount of hydro of anywhere on the Planet, and that alone is what inflates the overall renewable percentage for the whole World. Trust China to keep mum until it’s alive and where better to keep something like this pretty much secret than in probably one of the most inaccessible places on Earth. Critics say that the climate impact researchers have gone too far with their brand of political advice. “The two-degree target has little to do with serious science,” says Hans von Storch. Many of his fellow scientists, he adds, now see themselves too much as political activists who want to get something done. This, in turn, harms the credibility of science as a whole, he adds, and it is also a more deep-seated cause of the Climategate affair and the sloppy work on the IPCC report. The IPCC needs to be Abolished and its shyster manipulators run out of town and straight into a hard labour prison for racketeering . As Monckton has said …..you would only need to get a couple of these high profile CAGW evangelists and their cohorts in crime would scurry for the hills . It would be > ridiculous game of scams over , and then things might get back to being sensible . Its time to round up the lunatics that escaped into the ‘environmental movement’(bowel movement) , the U.N. (Unelected Nutters) , and Self Serving Politicians( those that say or do anything that keeps their own ‘entitlements’ flowing ) ….. round them up and pump ‘em full of happy drugs and reclose the eco-loon asylum doors . Beware of those that feel the need to have the word ‘Honorable’ inserted before their names! These criminals in suits could not run a milkbar , and yet they are allowed to blunder billions of borrowed dollars ,with interest , on a 100% hoax ! Where is the accountability ? Where ? What is the worst that happens to these Scammers ? Maybe a bum rap from the CAGW Presstitutes ……Maybe nothing at all ! The main job on the planet that is exclusively non performance based ….the life of a politician ….the bottom of the barrel . The biggest criminals on the planet now walk around in suits spouting CAGW Doctrine . What about the local shyster manipulators? Starting with the Prime Minister and his Deputy? I would generally support the conservative side of the coalition . I do not support our CAGW Spouter in Chief by Coup Malcom the TurnTrueB’LverBull , deputy dog backstabber Bishop , or True B’lver Hunt . In fact i cannot stomach how anybody of any political persuasion can vote for a CAGW True B’lver and or Manipulator ! To vote for such people is to vote for either liars and / or fools . >> CAGW = BS . Those that flog this climate medievalism are not fit for public office or any position of authority or scientific standing . I think at this stage the best tactic for we mere voters is to express our dissatisfaction with MPs in general by not giving Labor Greens Liberals Nationals the primary vote. Put Labor and Greens last, Liberals and Nationals second preference. And choose first preference carefully, probably an independent or other “conservative” candidate. that approach denies (whoops!) the major parties the funds for the first preference votes. Depend on it – that will get more attention more quickly than threatening to not vote for them. These Clown show acts need to realize that they are there for our benefit , not for their own nest feathering . I now will not vote for any that will not publicly slam this whole CAGW fiasco and urge others to do the same ….not make the best of bad choices . And those that promote the CAGW BS from all sides ,including the media , are in urgent need of the ‘Bum’s Rush Out’! Also under the radar is the very reluctant reporting of their sneaky self approved pre xmas 2% wage hike ! It seems the age of entitlement is only over for us ….not them . Where would they be if their pay was performance based ?….they would have to give their incomes back many fold . Your scammers have many loyal not so nice in their employ. Be sure you consider the worst that happens to those “you” give a s**t about! Later you can adjust your concerns. That is really the problem …too many ‘Turn the other Cheekers’ …the dumbed down pulic. Will the Wolves will look after us Sheep ?? Little wonder our ‘Esteemed (Shyster) Leaders’ pull the stunts they do…. and more often than not with their Appeaser Presstitutes propagating the new ‘party (totalitarian) line’ . I have no idea of who you may be. Your postings indicate lack of experiance to the extent that if you do not understand my post of December 19, 2015 at 4:09 pm. Whoever paid for your education even a penny, got only a rip off. I do not recommend any action, only consideration, of the is. Please go outside and watch then consider the obvious of any pet, creature, critter, or varminton this planet! Only eathlings, squeek, spout, or write without thinking. You can be bold, if that is your decision, after thinking, else you are only reacting to brainwashing. Your brainwashers are not stupid, they have been studying successful techniques to apply to young earthlings for over two centuries! That is your starting point!!! Will needs to learn not to post when he is inebriated or toked. Anyone can see the Jekyll and Hyde in his posts. Sober up, Will, then try to post something rational and coherent. The court said it would probe compensation payments handed out to former Chairman Felipe Benjumea and ex-Chief Executive Manuel Sanchez Ortega, after a complaint over their severance payments from some Abengoa bondholders. Benjumea, whose father founded Abengoa, will have to deposit 11.5 million euros ($12.5 million) with the court to cover potential liabilities, according to the ruling. The court will also look into accusations of insider trading against Sanchez, who has to post a bond of 4.5 million euros. The High Court said it would ask the stock market regulator for information on trading in Abengoa shares by BlackRock since Aug. 1. BlackRock did not comment. Abengoa was not immediately available to comment. Abengoa’s former chairman Felipe Benjumeale Llorente and ex-managing director Manuel Sanchez Ortega left the troubled renewable energy giant shortly before it declared itself close to bankruptcy last month, pocketing severance payments of several millions of euros each. Earlier Friday, its creditor banks agreed to inject enough fresh funds to keep the company afloat for about a month. from The Local, Spain: AFP: According to the Expansion business daily, the banks are willing to lend Abengoa a total of €113 million ($122 million), preserving its cash flow until mid-January, and allowing it to pay salaries and Christmas bonuses this month. It identified the creditor banks as Spain’s Banco Santander, Bankia, Banco Sabadell, Banco Popular, CaixaBank, French bank Credit Agricole and Britain’s HSBC plus the public credit body ICO. The deal is to (be) finalised next Wednesday, the paper said. I only heard crickets chirping when I’ve asked Thermageddonites what is the maximum atmospheric CO2 concentration that implies 1.5K and 2.0K temperature increase above pre-industrialisation levels. Now I can answer my own question for them. Cheers. Yes, coal—the bad boy of fossil fuels, the bane of environmentalists—gets new life this holiday season as the anti-present for the despised (or those with a sense of humor.). So the self hating Greens hate coal, old rotted plant matter made from sunshine, water and CO2. The CO2 itself is an invisible gas, very different to the water coming from chimneys and exhausts. Other impurities can be trapped, like sulphur. So coal is just the same as everything else which burns, just as people burn. Brown Coal which is just very wet, 50% water. Otherwise, almost little difference. Vilifying carbon and specifically Carbon Dioxide from which all plants are made by photosynthesis is madness. It is also chemical ignorance because if CO2 is pollution, so is all life on earth. Even Green is itself a hydrocarbon C55H72O5N4Mg. Evil. Greens may as well call themselves the hydrocarbons. The repression of the Green man knows no bounds, the other day someone yelled out “Coal Monkey!” from a passing Prius, just for hanging out the front of Hazelwood power station. The Green baboon doesn’t know his power comes from Hazelwood. They have indeed made ‘madness’ profitable! What not to like? The Science is settled ‘Al the convenient liar Gore ‘ said so ! So just run along now and make sure you all pay your ‘Great Big New Air Tax’ , like a good little citizen ,or no more breathing for you ! original headline was: “Tears as miners work final shift at Kellingley Colliery” same as the url. The end of underground coal mining in the UK has been marked with little fanfare, with miners leaving t he country’s last remaining deep coal pit with hugs, handshakes and just a few tears. Keith Poulson, branch secretary for Kellingley NUM, said the miners were angry because they believed the closure was unnecessary. He said: “I feel disappointed, I feel angry and, more importantly, I’ve seen my colleagues come off the last shift and you can see the anger and frustration that’s in their faces. They feel bitterly let down and disappointed. “There was a market for our coal, coal will still be burned at Drax power station for the next 10 years or more, and that’s what’s angering a lot of these men. The closure of Kellingley and the decline of the miners’ union, the NUM, is another reminder of how important, in a genuinely pluralist society, their role should be. ***The Conservatives may well come to rue the day they were so dismissive of a rival source of power. If you could burn sanctimony we’d never need fossil fuels again. I noticed Malcolm is having a genuine two bob each way now. No doubt hoping no one will notice the incredibly mixed messages he seems married to. ‘A leading think tank and lobby group on climate change is fighting for its survival after the multimillion-dollar support of its primary benefactor ran out. Good news! If only it was the ABC. There are more than enough Climate lobby groups. The result of Paris Climate COP 21 shows that their work is done. Time to move on. A French chef hired to work at the Paris climate change talks has been fined for razing 7,000 sq metres (75,000 sq feet) of protected forest near his restaurant. Marc Veyrat illegally destroyed the trees near the La Maison des Bois (House of the Trees) in the Alps. only “renewable vendors” can do the work? JPS added that the Old Harbour Bay Power Plant, currently in operation, is in urgent need of replacement by a plant capable of responding to the intermittent nature of the renewable coming on the grid. Plans for a 25-turbine wind farm have been abandoned after wind speeds were assessed to be too low to make the project commercially viable. ABO Wind UK’s Allt Carach Wind Farm was proposed for a site at Kilmorack near Beauly. The company had hoped to generate 75MW of electricity and supply it directly to the upgraded Beauly-Denny power line. Tests at the site identified “unexpectedly poor” speeds, said ABO. ***A spokesman added: “We had looked at various wind data, such as from other surrounding wind farm sites and the national wind speed database NOABL, which suggested this could have been an ideal site for a wind farm. The Binniza have claimed that, since filing the amparo, they have been subjected to threats and harassment. The Board of Directors of Dragonfly Industries International, a Texas-based company that’s behind a proposed wind farm project in Elm Springs, announced Thursday (Dec. 17) that company representatives will not be attending a City Council meeting scheduled for Dec. 21. Elm Springs Mayor Harold Douthit said he has had more than 250 questions submitted to the city concerning the wind farm. Opponents have also expressed concerns about Dragonfly CEO Jody Davis’ criminal past and Fell’s financial history. The one thing that could have given the Paris agreement any meaning, a ‘typo’. Funny thing, those temperatures. We’re having our usual overnight frost and cold windy days just like always for this time of year. You couldn’t tell a thing was amiss from observing what’s actually happening. So where is the problem? It certainly isn’t here. I wish it would warm up because with the current weather it’s not very likely to rain. And we desperately need the rain. So IPCC, put on your feathered headdress, get out your drums and do something worthwhile — start a rain dance. Nuts to your paper tiger agreements in Paris. Show us that you’ve been worth all the money spent on you over the years. Well, as they say, be careful what you wish for because you just might get it. Since yesterday (12/21/2015) it’s been warmer and raining. Storms north of us have caused the usual snow problems with Interstate 5 and other roads. And it’s the snow we need most desperately. Let’s have a real (severe) winter in the Sierra Nevada Mountains and do something to mitigate this drought. As an avid skier (I’ve had a Squaw pass for decades), this is only good news, even though it took twice the usual time to get back home this weekend. We’re already on a pace that comes close the more than 800″ of snow at 8000′ that fell during the 2010-2011 season. To put this in perspective, last season we got only 223″ which we could surpass before the end of this year. The average is well over 400″ at 8000′. If not for 2010-2011, the recent drought would have been far, far worse, but it will take a couple of consecutive good to average seasons before the drought will be mitigated. If the IPCC is right, certain things should have happened. eg hot spot above the tropics – (not there). Arctic should be ice free by 2013. (didn’t happen). Continued warming (satellite data shows no warming for the past 19 years). Australia was supposed to never have its dams full again (they overflowed). Weekly Climate and Energy News Roundup #210 | Watts Up With That? I agree, we have two chances of limiting the GMT increase to 1.5C – Buckley’s and none. Ignoring your childish IPCC ad hominems and straw men for the moment. You might be better off trying your calculations with the transient climate response (TCR) instead of the ECS – it takes a while for the global climate system to reach equilibrium so the ECS on shortish timeframes may not be appropriate. A 1.5C target probably does mean zero emissions pretty much now – in that case the CO2 concentration will drop down from 400ppm due to natural adsorption of CO2 by the carbon cycle. You didn’t give the reference to the COP21 info, I am assuming the COP21 info refers to zero net emissions of excess CO2. I did some research to find out what some are saying. One figure used is the globe is around 400 billion tonnes of CO2 short of the expected 1.5C of warming calculated using ECS. This is not a lot – 400 billion tonnes will most likely be added in the next 5-10 years, as early as 2020. But when they say 1.5C, I think they mean the amount of warming by 2100. A lot can happen in 85 years, in my opinion it would be possible to overshoot the 1.5C target then bring it down again later using some sort of carbon capture technology that takes decades to work (growing and burying biomass, reforestation, cloud and atmospheric aerosol engineering etc). Pointless rhetorical question. If you have a sensible question, I will answer it. You never had before. ! Poor empty-minded Harry. You have nothing to offer to rational discussion about anything to do with climate, and you know it. It takes a very sick, lonely mind to be attention seeking, like you are, at this time of year. A sort of slimy, self-loathing arrogance that you display in your ever post. But if that’s all you have in your life. I guess we can’t expect any better. You are starting to repeat yourself. I guess the meds affect your memory.